Just a reminder -- The Xbox Live Gold Membership service is free this weekend to all Xbox owners. 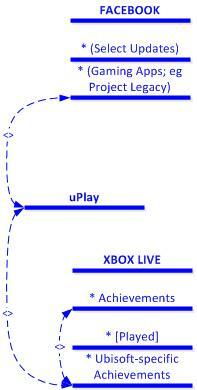 So, if you're normally a "Silver" or "Free" XBL user, this weekend gives you a chance to see what all of the fuss is about. Get access to multiplayer gaming, things like Netflix streaming (if you're a Netflix subscriber), ESPN-exclusive content, Gold-only (or available first) offers and demos, and a bunch of the stuff that makes gaming (for me) preferable on the Xbox. If you find you like the service, do yourself a favor and find a friend who already has a membership to refer you -- you both end up with some decent bonuses (extra XBL time, points for purchases, XBLA titles, and the like). I used to have my various social sites and feeds fairly connected -- in a way I wanted them to be. That fell apart over time (for mostly good reasons, as authentication between services tightened). 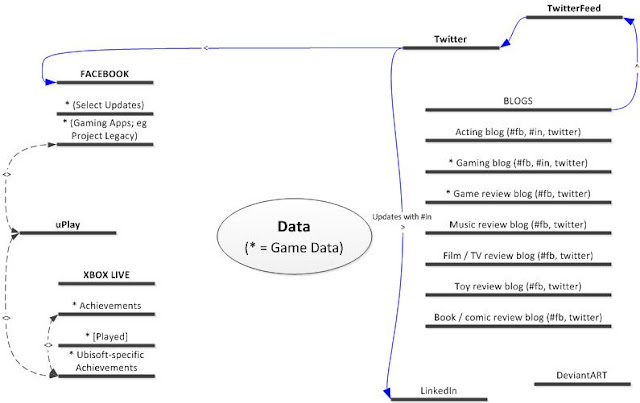 Since I'm all about planned setup with minimal follow on work (work smart to avoid working hard, when possible), I stepped back to look at how I could re-set what content goes where (and when), and at the same time push forward with what I'm calling an "integrated gaming" experiment, using Assassin's Creed: Brotherhood. The nice thing about the Ubisoft Facebook game and Uplay site is that despite still being in beta (there are some rough edges and non-enabled content), they take care of the integration / relation between the console achievements, uPlay account, and Facebook connections (once you do all of the requisite activations). Pieces of the Assassins Creed integrated gaming experience. Data sources and data pipes. For the most part, I use Twitter to fire off to my various pipes. By default, everything that goes on Twitter goes to Facebook (if I want the world to see it, I'm fine with friends seeing it -- but not vice versa). 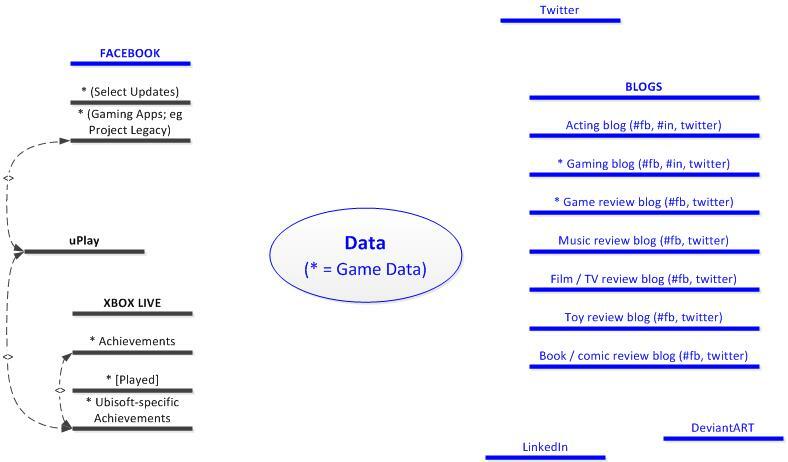 I can narrow that, and make it so that just tweets with "#fb" go to Facebook (and even though I don't use it, for clarity I've marked data in these diagrams I'd like to show up in Facebook with the "#fb" suffix). Likewise, currently, only tweets marked with "#in" go to LinkedIn, because I want to show a more targeted, professional slice of my micro (nano? pico?) posts on that site. So, to make 1 and 2 above "easy", I used http://twitterfeed.com/ to post all of my blogs to Twitter, which then automatically pipes all of them to Facebook. To avoid having to create and maintain a separate Twitter ID for "professional posts" to go just to LinkedIn, and because the LinkedIn BlogLink application seemed to be down, I instead added the "#in" suffix in TwitterFeed to any posts from the two blogs I want to go to LinkedIn. 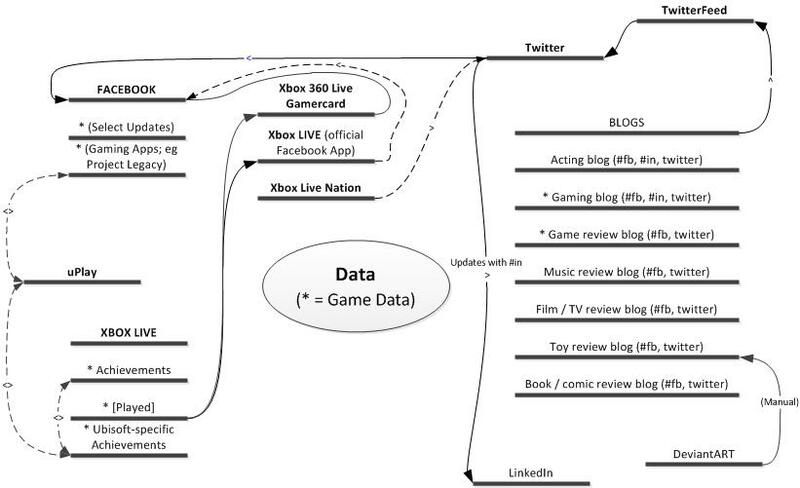 Getting my Xbox Live data (Achievements and what I've played / am playing) used to be as easy as logging onto the various gaming social sites, being careful not to provide Xbox Live credentials to potentially skeevy sites. My previous site of preference was GamerDNA.com, but at some point that seems to have stopped working, and is at best running a week or so behind what I do on my Xbox 360 -- which defeats my real-time notification goal. Also, with regular changes to Twitter's API to require OATH, etc., and Microsoft understandably not providing an RSS feed of my XBL activity (privacy concerns for minors, etc. ), it's a bit tougher to populate that feed. I understand the gimping, but if I've chosen to set my XBL privacy to "everyone", I should have access to that feed to do with as I please. I was using Xbox Live Nation's Twitter integration, which is supposed to update just once an hour, when I'm online only, but I actually don't think this works anymore, since it doesn't use OATH. Xbox apps on Facebook have been spotty at best, and they don't solve my Twitter post needs. 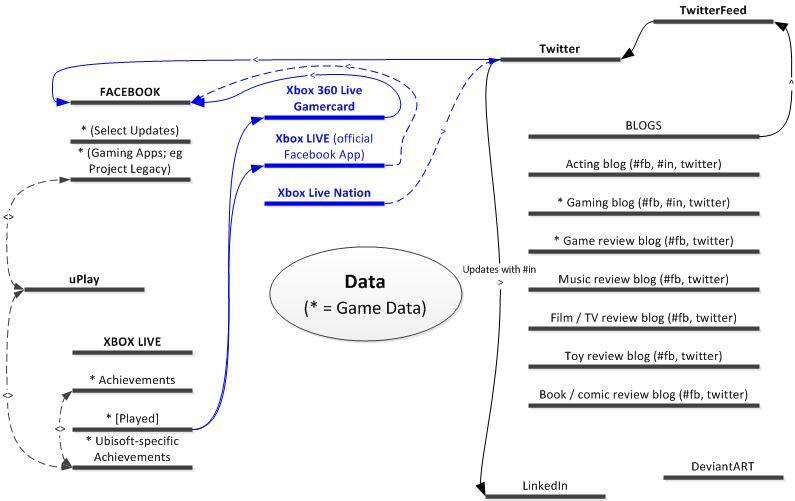 Xbox Live data piped to Facebook, via three implementations, and only a partial solution. That said, I'm also using the "Xbox 360 Live Gamercard" app for Facebook for now, which says it will post my status and Achievements to Facebook (I've used it before, but it stopped working, so I removed and re-added it, but haven't yet seen it update my online status). And I'm using the official Twitter / Xbox App, thought that only shows status to people in my XBL friends list who also have the official app installed, too. If you have a better way to do this, let me know in the comments. 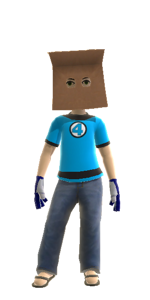 And maybe next time, I'll talk about the actual Assassin's Creed integrated gaming experience itself. While I have my Twitter feed available to the world, and I'm very cognizant, intelligent, and responsible social media user, I would probably change my tweets to "protected" if I were working for an anti-social media corporation. This diagram is loosely based on "Context Diagrams" from Atlantic Systems Guild, the folks who did a portion of my requirements and systems analysis training back in the day, and I've used many of the tools ever since. For my toy review blog, I now host the pictures on DeviantART, because this gives me a another audience for cross-posting.